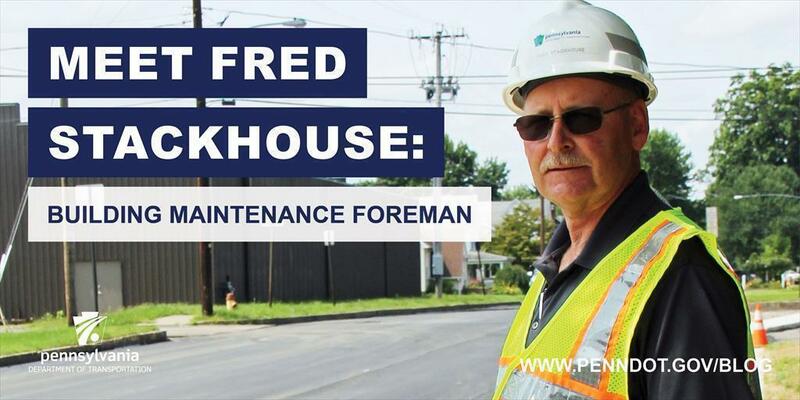 Dependability has been a hallmark of PennDOT District 3 Building Maintenance Foreman Fred Stackhouse's 20-year career with the department. Hired in October 1997 as a maintenance repairman, he has been at his current position for more than 14 years. "I'm equally proud to work for PennDOT and be on a team that positively impacts the lives of so many people." Stackhouse is responsible for maintaining the district office buildings and grounds, located in Montoursville, Lycoming County, as well as in the district's nine counties — Bradford, Columbia, Lycoming, Montour, Northumberland, Snyder, Sullivan, Tioga, and Union. This includes overseeing plumbing, electrical and mechanical systems; building maintenance; lawns and landscaping; and removing snow from sidewalks and parking lots. Stackhouse gives his best in everything he does, which is why he has been named district employee of the month multiple times. He's also been a member of the team named Group of the Quarter on several occasions. He works extra hours, even if it's during a weekend or other off hours, to make sure a job is completed. During the winter, he constantly monitors the weather so he can be at work for snow removal before staff arrives. Stackhouse's strong work ethic at PennDOT mirrors his dedication as past president and current executive board member of the Picture Rocks (Lycoming County) Lions Club. He is involved in the club's many fundraisers and community endeavors, including making and selling sauerkraut, operating food stands at various events in the area, performing litter pick-up along a section of Route 220 between Hughesville and the Sullivan County line, and supporting programs such as Camp Victory, the Leader Dog Program and donating to Muncy Valley Hospital. "It's gratifying to be part of a group such as the Lions Club that does so much for the community," Stackhouse said. "I'm equally proud to work for PennDOT and be on a team that positively impacts the lives of so many people. "PennDOT provides excellent employment and advancement opportunities to anyone with a desire to work hard and strive for excellence," he added. "This is a great organization and I'm thankful I made a career here." Stackhouse lives in Hughesville with his wife Donna and daughter Amanda.